Songs and rhymes have been used by physicians for centuries in China as a means of memorising and passing on methods of practice and behaviour, moral attitudes, effective points, diagnostic tips and rules of thumb. These newly translated poems offer a rich insight into the life and thought of these skilled doctors, as well as practical indications for treatment. 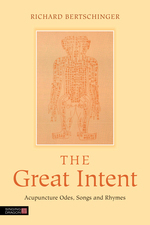 Contemporary acupuncturists can see from these poems the depths of the tradition, better understand a breadth of diagnostic skills and treatment planning, and as a result greatly improve their appreciation of intent within their own practice. The poems also serve as a gentle introduction to the philosophy behind acupuncture practice. This is the first translation of these acupuncture odes, songs and rhymes from the Great Compendium of Acupuncture and Moxibustion compiled by the Chinese physician Yang Jizhou during late Ming China. The book includes a comprehensive introduction that places the work in historical, cultural, and medical context, a symptom index, a point index glossary and a list of helpful points for common signs and symptoms encountered in acupuncture and physiotherapy clinics. Richard Bertschinger studied for ten years with the Taoist sage and Master, Gia-fu Feng. A practising acupuncturist, teacher of the healing arts, and translator of ancient Chinese texts, he works and practises in Somerset, England.